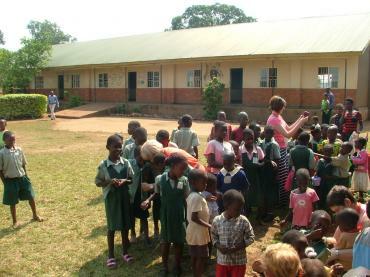 My cross cultural experience involved spending a fortnight with schools in Uganda working with Fields of Life (FoL). FoL is a Christian International Development organisation that reaches out to East Africa by providing schools, community schemes and education programmes. I went to Uganda as part of a team, of 15, from Newtownbreda Baptist. The team, which included my wife Anne, left in the early hours of Saturday, 30th July and arrived in Kampala, via Rwanda, late on Monday 1st August. The next day, we set off for the Tom and Margaret Carroll School in Jinja where we received an enthusiastic welcome and immediately began our programme - teaching local school evangelists about organising kids clubs. Some of the team also presented the health and hygiene programme, 'I am Girl', developed by FoL. I was involved in running kid’s clubs and leading the school evangelists in devotions. On Friday, we attended the official opening of a well that had been dug for a remote community in Namakonkome parish. The following Sunday, we arrived at Lusango Living Hope School, where we had previously worked and where Lusango Christian Fellowship Church meets. Some of the team took the Sunday school while others assisted with the service - I preached. Several people came forward for prayer afterwards. In the afternoon, I led a Bible study with 40 local pastors, introducing them to training via correspondence courses. During the week, we ran the programme for school evangelists and children and on our final Friday we visited families in Lusango village to give out care packs. It was a demanding fortnight that raised awareness of the great need and the great love for Christ that there is in Uganda.